If you’re new to sewer jetting you might wonder how long a sewer jetter nozzle can be expected to last. Knowing this information can help you plan the purchase of a spare. The good news is that high-quality sewer jetter nozzles, including the nozzles found on Clog Hog drain cleaners, tend to wear out gradually with a slow enlargement of their jet orifices over time. For this reason you may not notice as the orifices grow larger and the cleaning pressure at the tip begins to drop. 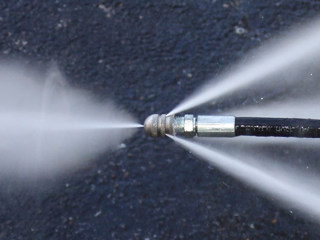 As a general rule, if you’re using a high-quality sewer jetter nozzle from a US or German manufacturer, have a water supply that’s reasonably low in sediments, own a pressure washer that operates at 4,000 PSI or less, and are cleaning primarily PVC sewer pipe you can expect to perform roughly 20 full-length drain cleanings with a 100-foot sewer jetter before replacing your nozzle. For most homeowners this equates to several years of use before a replacement nozzle is needed. Remember to inspect all components of your sewer jetter after each use – including the nozzle, hose, and end fittings – and replace any part that appears damaged or worn.